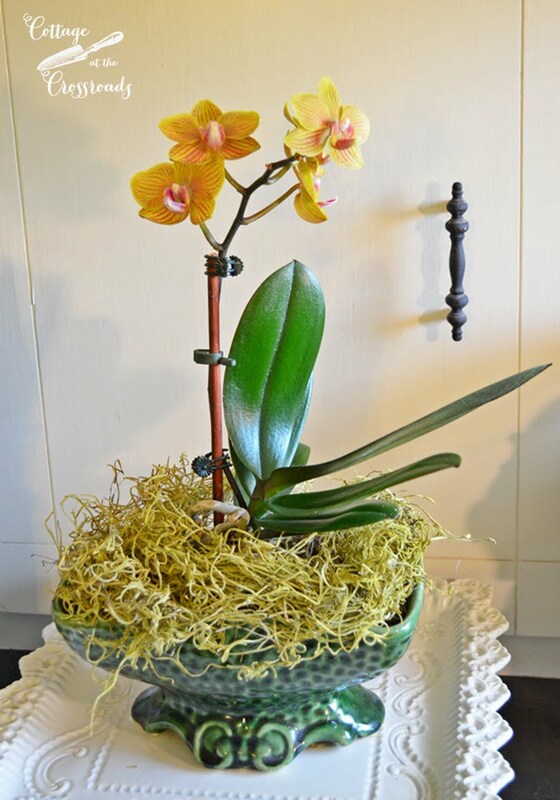 I thought I’d share a little spring decor in the kitchen today. 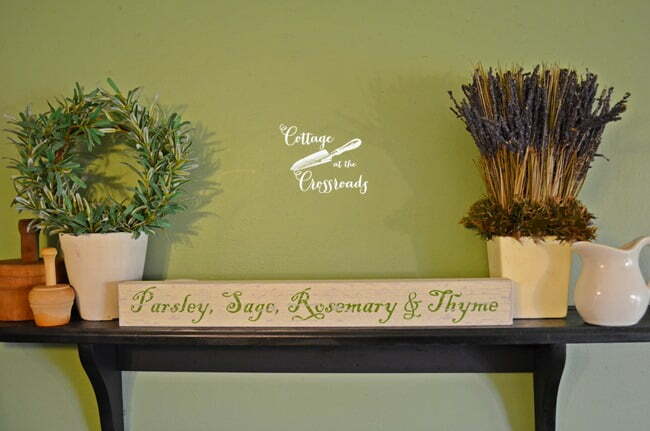 If you’ve been following our blog for a while, you know that we have a large chalkboard in our kitchen which I use as a place to display seasonal decor. 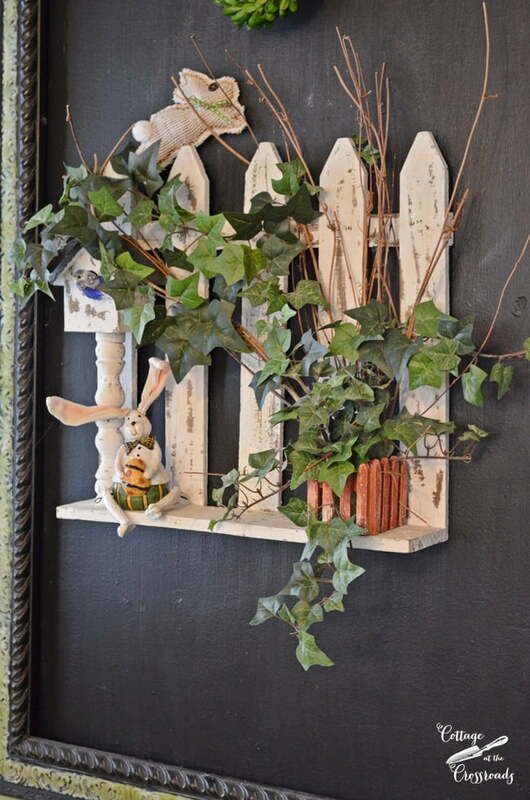 Well, a couple of months ago, I spotted this little wooden picket fence display in an antique store. It came with the faux ivy and twigs already attached. And as soon as I saw it, I thought it was just the right size for the chalkboard. I didn’t purchase it that day but went back again about a month later and it was still there, calling my name! My first thought was to take off the ivy and replace it with flowers but the more I fluffed it, the more I liked it. 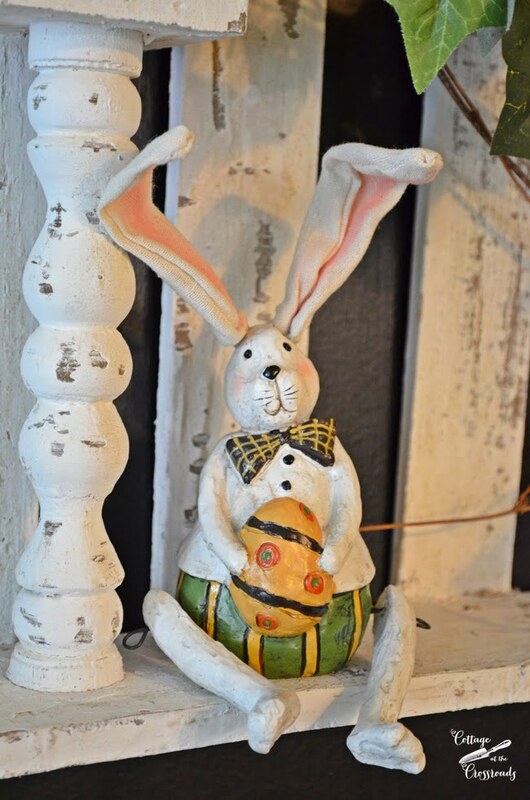 My little display was really coming together when I found this adorable shelf-sitting bunny at Stein Mart! 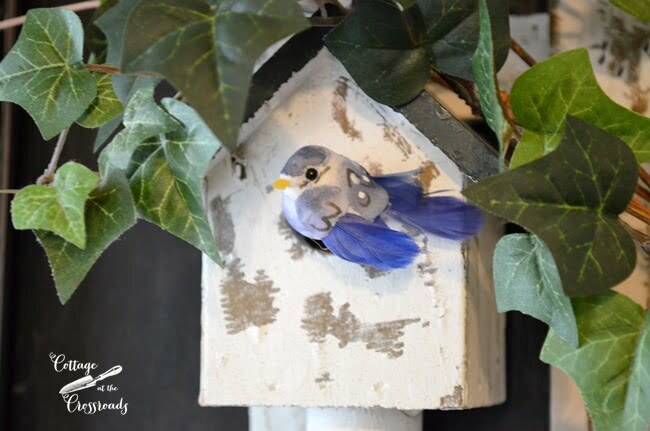 I added a little birdie to the bird house because the birds are rejoicing that it’s spring. 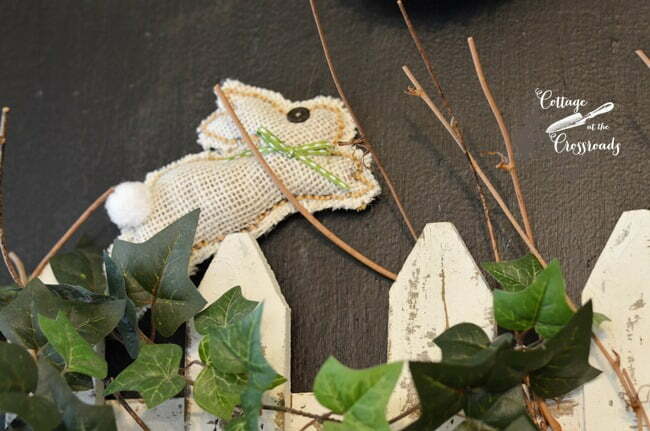 This little bunny hopped off the garland that I made and used on our Spring Mantel last year. 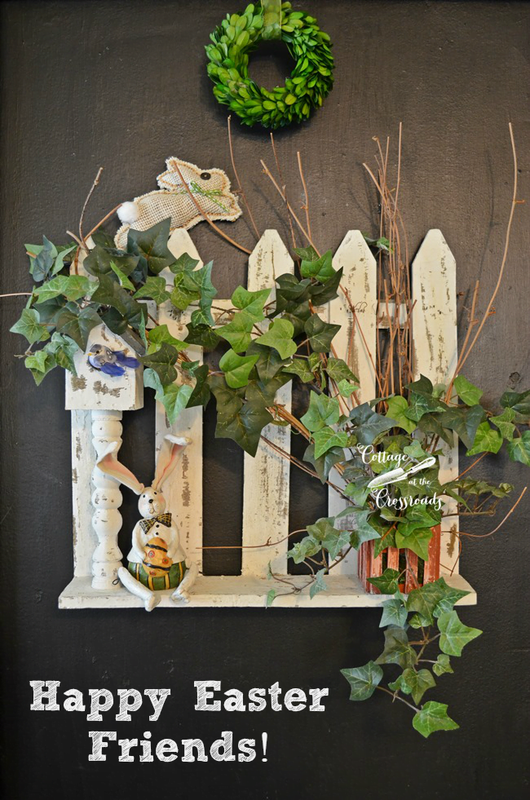 I’m thinking that I may leave this little picket fence up all year long and decorate it for the various seasons, don’t you think? 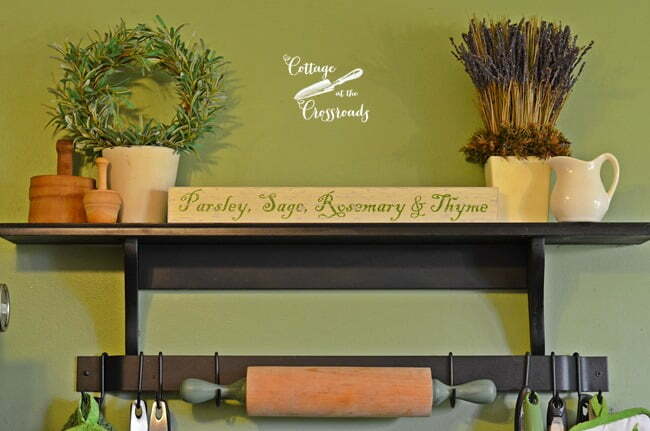 I added a new little sign on the shelf above the range, and I hung the rolling pin here. I’m in search for the perfect little tea towels to hang on it. The little herb sign came from Stein Mart. In the corner is a little spring vignette. 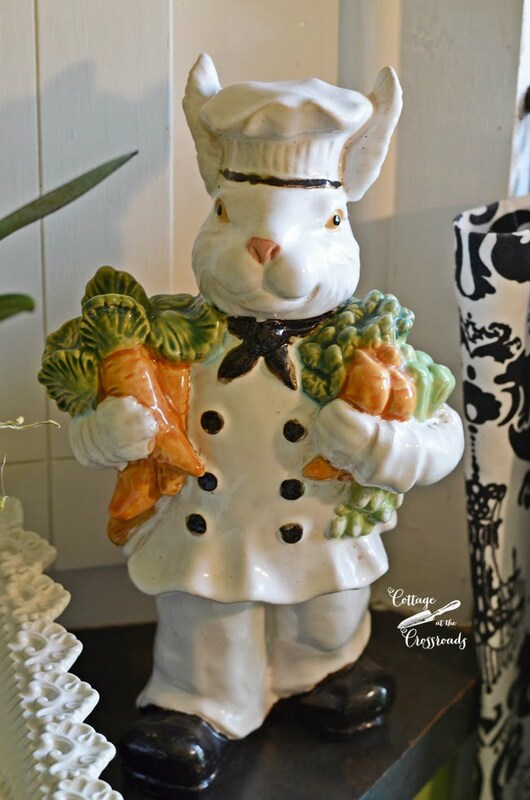 You may remember seeing the chef bunny in years past, and I enjoy bringing him out each year. 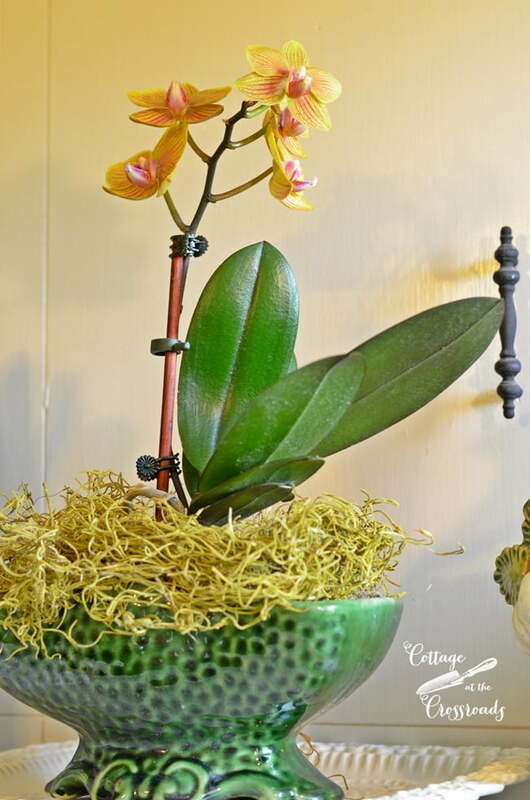 I’ve found the perfect spot for my orchid. It loves the filtered light from the kitchen windows. It’s planted in a vintage planter that I got at the auction. I think it’s texture contrasts beautifully with the cake stand. This is the first orchid that I’ve attempted to grow, and I’m thrilled that it’s thriving in this spot. Its blossoms got me through the last month of winter that seemed to drag on forever! 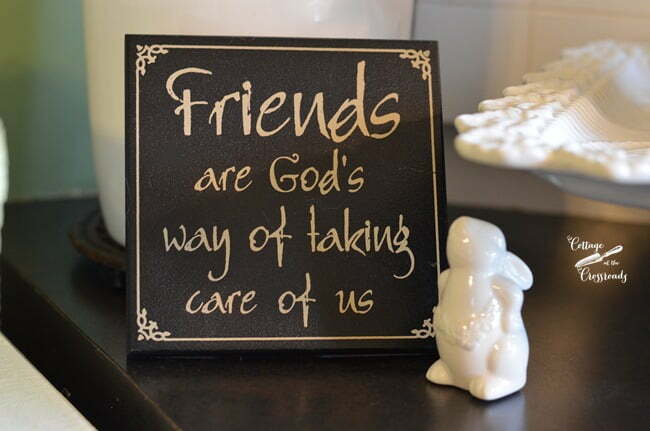 But my favorite thing in this corner is this sign that was given to me by a special friend. 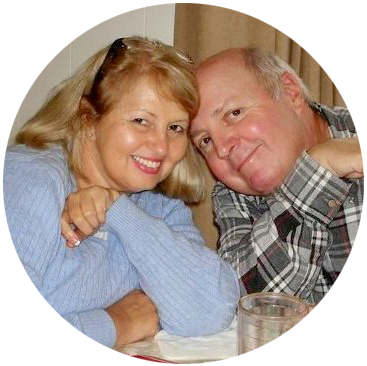 I count all of you readers as my friends, and I’m so appreciative each time you stop by to visit. Easter blessings from our house to yours! So sweet, and I love your carrot toting chef!! Thefence is perfect! I do love that bunny carrying carrots. Makes so much more sense than a bunny carrying eggs! :). Hope all is well there! Love all your spring touches!!!! Hope you and Leo had a wonderful Easter…. I’m sure you have had your hands in the dirt!!!!!!!! I just had to stop over to say I love your new blog design! It’s just beautiful!!! 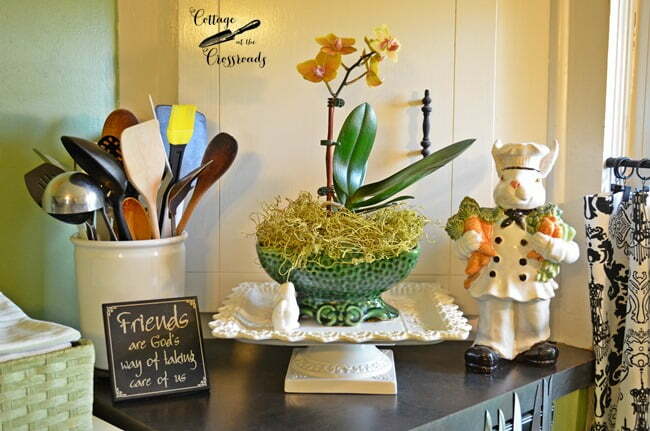 Just love what you did in the kitchen to bring the beautiful season of Spring indoors….love that adorable picket fence shelf on the chalkboard…adorable bunny chef and orchid vignette…I so love orchids and the container is perfect!…Hope you had a great weekend/Easter! 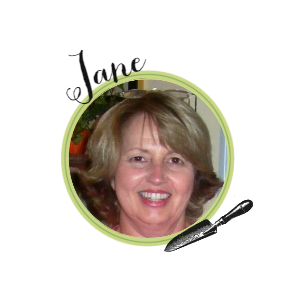 Jane, I love this! So pretty!! Happy Easter. I love that little picket fence shelf! It looks perfect on the chalk board. 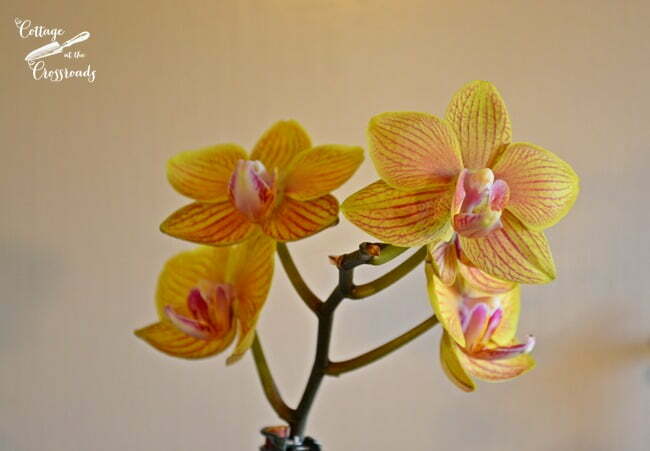 You are very talented if you can grow orchids. The blooms are beautiful! 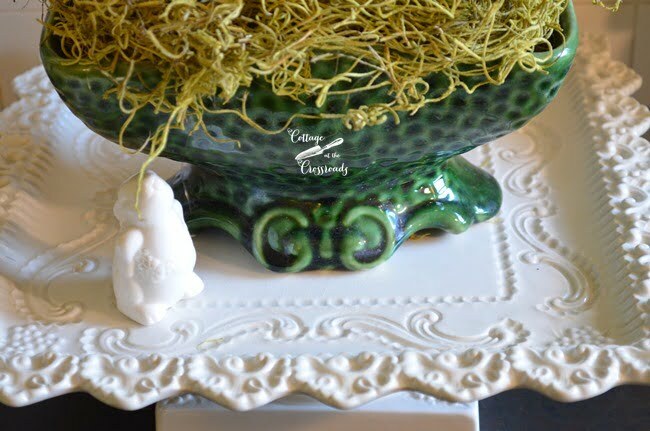 Cute decor, Jane and I hope you had a Happy Easter! Such cute Easter/Spring decorating in your kitchen! I think that is a great idea to leave that darling picket fence up and change out the decorations on it seasonally. Happy Easter to you and Leo! I don’t read many blogs because of the time involved but I do read yours and I have to say that yours must be the best one on the web. Really enjoy it. It all looks so fresh and springy Jane. Hope you and Leo and your family have a wonderful day today. I’ve forgotten how you attach things to chalkboard so as not to mar it!!! Love your post this Easter morn! Thank you so much for all the time you put into this blog. I love the ideas you give us and how you are so creative. Kind of a crazy question, but how do you hang those things on your chalkboard without ruining it???? Happy Easter to you and your family too. Thanks for all your inspirations and wonderful ideas.